Statewide Campaign. Results for 8th Annual Cape Fear Red Trout Celebrity Classic Tournament benefiting the Cystic Fibrosis Foundation! We have a wide stable of professional guides ready to provide the finest red drum and trout fishing this region has to offer. ESPN will cover this year’s Tournament! The 8th Annual Red Trout Celebrity Classic at Wrightsville Beach concluded today with perfect Fall fishing conditions. Unlike yesterday, the wind and water were calm; sunny skies and fall temperatures both days. All proceeds from this two day, catch and release event go to Cystic Fibrosis. ESPN covered the event, based at the Blockade Runner Resort, for future broadcast of the Red Trout Series. Grand Champion: George Brinson of Wilmington, Angler; Rennie Clark of Carolina Beach, Guide. Guide Rennie Clark fell into the water yesterday; was late getting back to the dock; yesterday’s catch was disqualified. However, they won the top prize (and others) by catching 5 redfish and 28 trout in the final day! Runner-Up Champion: Scotty Gould of Wilmington, Angler; Rennie Clark of Carolina Beach, Guide. Team Champions: Scotty Gould and George Brinson, Anglers of Wilmington; Rennie Clark of Carolina Beach, Guide. Lady Angler: Liz Pitts of Wilmington; with Jot Owens of Wilmington as Guide. Junior Angler: Wrenn Millis, 9 years old, of Wilmington. Wrenn caught 7 fish. His guide was Phillip Thompson of Wilmington. 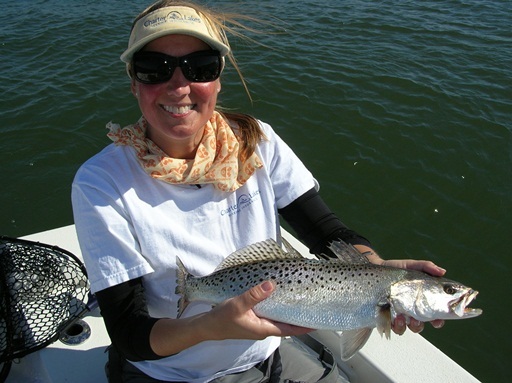 Most Trout Caught: George Brinson of Wilmington, Angler; Rennie Clark of Carolina Beach, Guide. Most Redfish Caught: George Brinson of Wilmington, Angler; Rennie Clark of Carolina Beach, Guide. Largest Trout: John Pilon of Fayetteville, Angler (22 inch trout); Jamie Rushing of Wilmington, Guide. 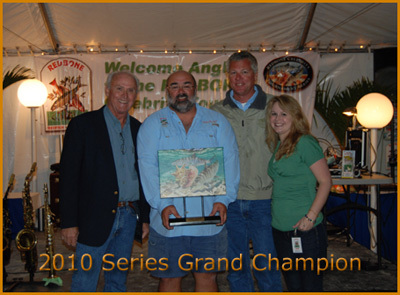 Largest Redfish: Keith Gallagher of Fayetteville, Angler (29 inches); John Huff of Wrightsville Beach, Guide. Bait Division: Liz Pitts of Wilmington, Angler; Jot Owens of Wilmington, Guide. Spin Division: George Brinson of Wilmington, Angler; Rennie Clark of Carolina Beach, Guide. Fly Division: Richard Sear of Hampstead, Angler; Seth Vernon of Wilmington, Guide. All prizes; bragging rights! Money goes to Cystic Fibrosis.